Today was rainy, stormy, and downright dreary. I even worked through lunch to avoid having to get out in it. I was due for a rest day (either today or tomorrow). I decided that I would wait and see how I felt by the end of the day. I have gotten used to splitting up my workouts and was not really enjoying the idea of a long cardio session. Since I was leaving earlier because of working through lunch, I decided I would go ahead and do a 40-minute premix from Step Blast. That one is always fun and still gets my heart rate up there. When I walked out of the office, the sun was shining. What? When did that happen. That's when the debate started in my head: Do I really want to workout inside? It's sunny, but I don't want to wait for Jason to get home to run. I could go run errands and enjoy a run outside tomorrow. But I wasn't sure what Jason's workout plans were. Oh decisions. I ended up running a very pleasant (yes, I said pleasant) 5-mile, solo run. Truth be told, I could have easily done 6 I was feeling so good. I won't go so far as to say runner's high, but I definitely felt much better after the run. I feel like I was able to clear my head a bit. I did have a few orders for some doggy treats to get done. The working through lunch thing today worked out great for me. I was able to get in a good run with plenty of time to do the treat baking finishing it all by 5:30. Love it when things fall into place like that. I will say that after running then baking, my energy level finally took a nose dive. I had absolutely no desire to make dinner. I was starving, but so unmotivated. Jason suggest a "Chicken" salad. I wasn't sure if he meant "chicken" ON a salad or "chicken" salad as in the mayo type. He meant the mayo type sans the mayo. 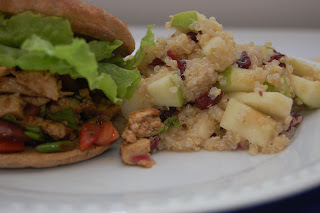 As a side I suggested an Apple Cranberry Quinoa to go with his Balsamic "Chicken" Salad Sandwiches. I do apologize for the lack of exact amounts. Jason did the cooking; I just logged the ingredients. Heat or cook the "chicken" substitute then add that along with nutritional yeast flakes, olives, pepperoncini, and onions to the vinaigrette and let set for at least 30 minutes. You can serve this over a bed of lettuce or as a sandwich with lettuce or spinach and tomatoes. Cook quinoa according to directions. We did add in dried shallots, garlic powder, and sea salt while cooking. In mixing bowl, combine all ingredients. Allow to set if you have time as the flavors meld over time. I will admit that this was a messy sandwich. Jason put his in a wrap, which is what I'd suggest as well. I had meant to add toasted walnuts to the quinoa, so that's something to remember for the next time I make it. That salad sounds so refreshing. I desperately need to get a good workout in STAT. hemming and hawing would be great pet names... it is so true that workouts make you feel better! We had rain and sun, rain and sun, all day today! Sometimes both at the same time! You are the queen of creative quinoa dishes! Glad the sun came out so you could get in a run. Being outside when the weather is nice always helps me to clear my head. Your food always looks so darn yummy!!! Krystina @ Organically Me It was really a nice flavor combo. It works really well with wheat berries too. Katherine @ What About Summer LOL you're so right about the pet names! Anna @ Newlywed, Newly Veg Thanks girl! I'm bound and determined to find one that Jason really likes LOL. I love it and it's so easy. Gotta love those rain/sun/rain days. Kelsey @ Snacking Squirrel LOL - let me know how it turns out! Averie @ Loves Veggies and Yoga Oddly enough, he used to be the main cook of the house! Simple Daisy Thank you very much for the compliment. I appreciate it a great deal. I think rainy days are conducive to hemming and hawing. I like the idea of adding dried cranberries to quinoa. I've only ever cooked quinoa plain, but it'd be nice to use a tangy and sweet addition. Thanks for the idea. don't you love when a run gives you clarity and clearness? love that feeling too.....hopefully i will get it tonight when i run :) happy friday girl! Who do you make dog treats for? Haha I can definitely relate to not being able to make up my mind about workouts! It takes me forever to decide if I should do it and what I should do. I have some red quinoa to use up and I bet that would work for the salad as well! I can't wait to test it out. 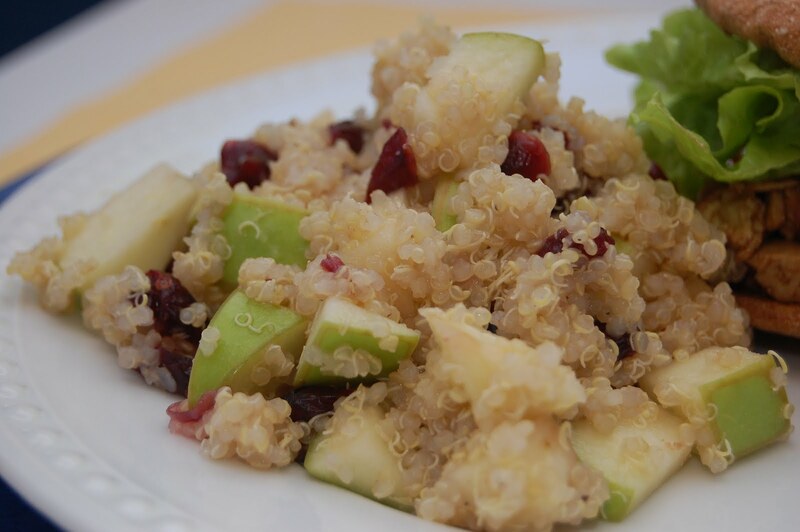 The apple and cranberry quinoa sounds so good! I love finding new ways to use quinoa. This is great! Eh messy sandwiches are the BEST! That apple and cranberry quinoa sounds great! Lisa @ Lisa's Foods on the Move Thanks so much for stopping by. I look forward to checking out your blog. I love to add lots of flavors to my quinoa. Raisins are good too. Kalli @ Fit and Forty Something Hope you get in a good run too girl! Happy Friday to you! Lindsey @ Cardio Pizza Thanks girl. I make treats for my pups but also to sell. Holly @ Greek Yogurt and Apple Slices You should try it at least once. It's so easy and healthy too. Chelsea @ The Healthy Munchkin I'm usually not quite so bad at trying to figure it out since I do have weights planned out in a rotation. But it was just up in the air about resting or not, running or step. LOL. Honestly, I used to not be a big fan of fruits in my meals. Megan @ The Oatmeal Diaries I have not tried the red quinoa yet. Let me know how the dish turns out. Thanks Kristen @ Swanky Dietitian . I like trying to find new ways to use it too. It's so versatile! Dawn @ Healthy San Diego Living Messy sandwiches are kind of fun aren't they?! What is Quorn? I am learning so many new things lately. I just fond out what polenta was! haha! Your dinner looks fab and sometimes sloppy dinners are the best! I hope the weather is staying nice for you this weekend? ahh with sandwiches..the messier, the better!!! 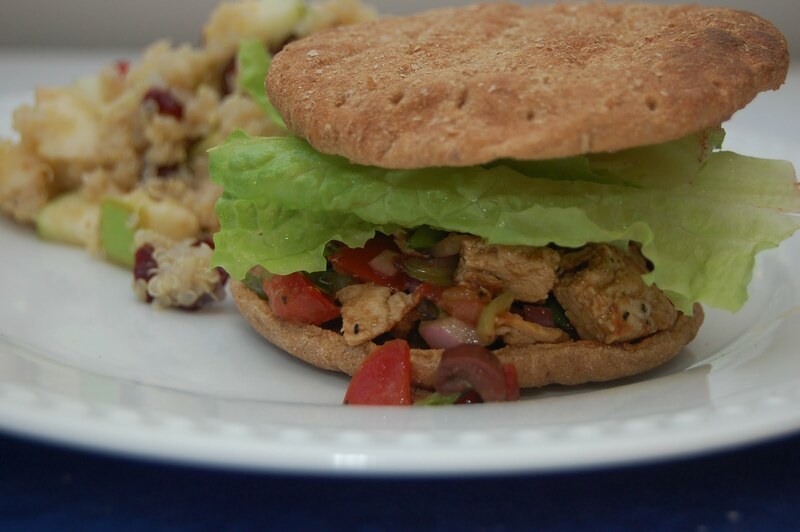 That chicken salad sounds absolutely divine! Thanks Erica @ Fashion Meets Food ! I thought it was pretty good too. The dried cranberries and/or apples would have been a great addition as an option as well.